Le Creuset is known as a maker of different types of cookware including teakettles. There are different types of kettles, some which are made using enamel on steel, and others using stainless steel. You may, therefore, find it challenging to determine the best Le Creuset tea kettle for you considering the different kettles available. To make this easier, in this Le Creuset Teakettle reviews post, I will talk about three kettles that got my attention. The kettles can be used when you are preparing tea, oatmeal, French press coffee and other meals that are prepared instantly using hot water. The kettles also come in different sizes and designs, with some being more traditional while others are modern. However, the most important part of choosing the suitable one for you is to assess your needs and see which kettle can meet them. With curves in the right places, this Le Creuset kettle heats water up to 1 ¼ Quart. 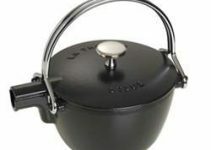 It has a smaller capacity than the classic one and it is designed slightly differently, though it has the same basic features such as an ergonomic handle that is lockable, a round-shaped lid that can be removed and the whistling. It can also be used on different heat sources. The kettle comes in 2 sizes and 11 different colors such as the Caribbean, black, white, cobalt blue, cherry red, flame, and Marseille. The kettle comes in a great design for aesthetic purposes and in different colors, which you can choose to fit your taste. The handle is ergonomic and it locks in place to make lifting and pouring easy. The lid features a phenolic knob that helps so you are not burned when lifting it. It is easy to know when the water boils through the whistling. The kettle is prone to the enamel falling off, especially if it is scratched or mishandled. This means that it should be handled with care. You should be careful not to touch the metal side of the handle so you don’t get burnt. The Le Creuset Enamel on steel Demi 1 ¼ Quart kettle provides a convenient way of heating the water. It is cheaper than the classic kettle, most likely due to its size, but with similar functionality. However, you need to be careful when handling it so you don’t scratch the enamel. The Oolong kettle has the same features as the classic Le Creuset kettle, only it has a different design and size. The kettle has a capacity of 1.6 quarts, it’s made of carbon steel and finished with porcelain enamel. Another one of its strong features is its beauty and colorfulness, in which case it is available in ten colors. Other features include its whistling ability, its ergonomic and heat-resistant handle and its round-shaped lid with a phenolic lid knob. It can also be used on various heat sources including induction, gas, electric, ceramic and halogen. The kettle is well -and beautiful with many colors to choose from. It can be used on different heat sources, including induction and ceramic. The anti-slip handle is loop-shaped for a more secure grip. You can pour even with one hand. The kettle provides quick heating especially due to the large size of its base. It’s rather expensive in comparison to other Le Creuset kettles. The enamel is prone to chipping if mishandled. The Le Creuset Enameled Steel 1.6 Quart Oolong kettle combines great design with functionality. Its beauty attracts many users and its functionality keeps them. However, you have to dig deeper in your pockets and you are also required to handle the kettle with care so that the enamel does not chip. This is the classic Le Creuset tea kettle that is made with carbon steel and given a finish with porcelain enamel. Other than tea, the kettle can be used in the preparation of oatmeal and French press coffee, and oolong tea. It comes in 2 sizes and 15 colors and some of them include black, white, red, Caribbean, cassis, flame, Marseille, and palm. There is also a similar version of the kettle but it is made with stainless steel. Some of the features you will find on it include a capacity of 1-4/5 Quart, a whistling ability, an ergonomic handle that is heat-resistant and a round-shaped lid that is removable. The kettle is available in a variety of colors and you can choose the one that suits your décor. You can know when the water boils due to the whistling alert. The kettle can be used on different types of heat sources such as electric, gas, ceramic and even induction, and therefore it is not limiting. It boils water quickly thanks to its wide base that gets into to contact with the heating element. The high upright lockable handle protects the hands from the heat. The kettle may not be as useful when the whistle fails, as experienced by some of its users because it no longer has a way of alerting when the water boils – a fact that can lead to fires if it overheats. Some users find the enamel on steel models rust after a while. The Le Creuset Enamel on Steel 1- 4/5 Quart Whistling kettle makes boiling water in a kettle a great experience. The kettle notifies you when the water boils as it whistles, it is well designed and made of materials that last. However, the enamel model is prone to rust if not used properly by leaving water in it or scratching the enamel. This can be countered by using the stainless steel kettle. The Le Creuset Enamel on steel Demi 1 ¼-Quart kettle takes the first position due to its capacity, design, and affordability. Le Creuset Enameled Steel 1.6 Quart Oolong kettle follows at the second position, though it does not have a large capacity, its design and price are favorable in comparison to the Le Creuset Enamel on Steel 1- 4/5 Quart Whistling kettle, which takes the last position due to its high price and design. Do you like whistling kettles? Read my post about the best whistling tea kettle. What do you think about these kettles? Tell us in the comments area below.